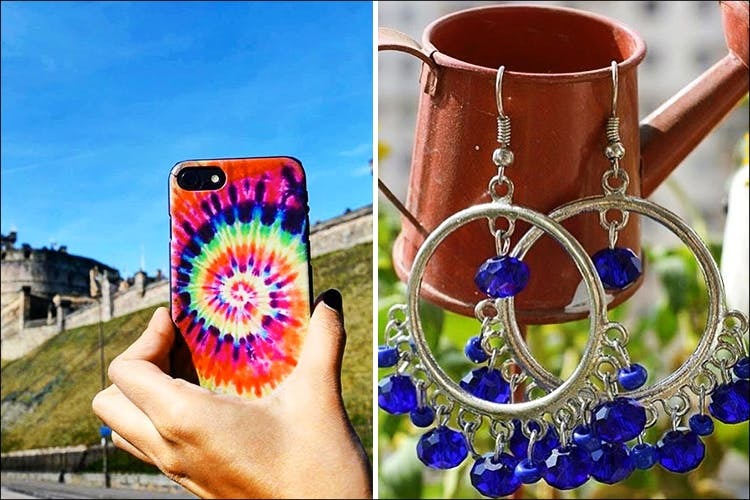 Tassel Earrings And Dream Catcher Phone Covers, A Store That Has It All! Vintage Monkey is an online accessory store based out of Gurgaon that also does clothing, phone covers, bags and more. Started by an avid traveller, Paavani Khanna when she was a student in DU, Vintage Monkey is an eclectic mix of curated pieces from her travels as well as her personal designs. From retro phone covers to chunky, tribal jewelry, the brand has a fun, carefree vibe, which resonates in its designs. They do quirky phone covers with vibrant designs, from bananas to the Eiffel Tower! Their earrings range from tiny, delicate pieces to massive, dramatic ones. A heady mix of statement pieces and everyday accessories, their designs are perfect for the gypsy within! We’re especially eyeing their “I love wine” pendants! They also do fun scarves and t-shirts. Their banjara bags are just what you need for the upcoming shaadi season, as well as their funky footwear. Products start at INR 199 and go up to INR 2,500. They also have great offers on their products, buy one with another and get up to INR 100 off! Vintage Monkey should definitely be on every bohemian accessory lover’s list. Check out their collection on Instagram here.